Larry J. Sabato's Crystal Ball » You’re Not From Around Here, Are You? While Daniel Webster died an American in 1852, his political legacy does not belong to just one state, but two: New Hampshire and Massachusetts. Born in New Hampshire, Webster represented the Granite State in the House of Representatives from 1813 to 1817. But he then moved to Massachusetts seeking to improve his legal career, only to wind up returning to the House as a Bay State congressman in 1823. (Republican ex-Sen. Scott Brown is currently pondering the reverse move.) Webster went on to have a lengthy stay in the Senate, becoming part of the upper chamber’s revered “Great Triumvirate” with Henry Clay and John C. Calhoun. As a transplanted New Hampshirite representing Massachusetts, Webster’s individual case demonstrates how politics can be affected by the movement of Americans from state to state. In the aftermath of the 2012 election, the “demographics as destiny” discussion has dominated political analysis, with the latest data being provided by last week’s U.S. Census report on the 2012 electorate. But one demographic statistic hasn’t received much attention in the conversation: state nativity rates — that is, the percentage of people residing in a state who were born there. Does that statistic tell us anything about the politics of a state? If we order the states by nativity percentage (Chart 1) while also considering which party each state supported in 2012, we find that there are more Blue states than Red states with lower levels of nativity. Yet it’s obvious that high nativity rates in Iowa, Michigan, Ohio, Pennsylvania and Wisconsin did not keep Barack Obama from winning those states in 2012. 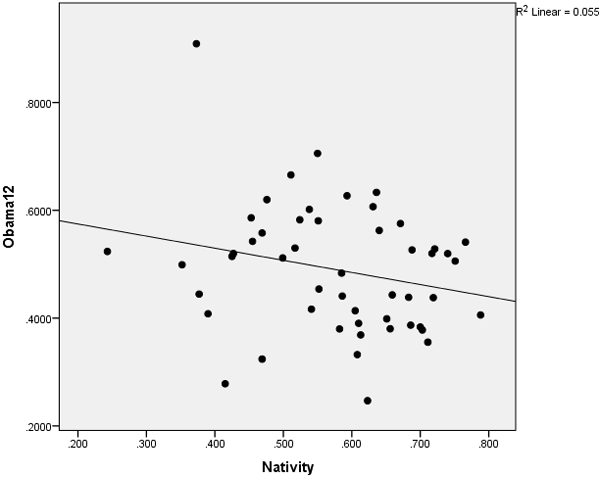 If we dig deeper by analyzing the relationship between state nativity rates and President Obama’s support level, we find evidence that, superficially, nativity rates tell us little. As Chart 2 indicates, there is only a weak negative correlation (R = -.235) between a state’s nativity percentage and the percentage of the vote Obama received in the 50 states plus Washington, D.C. The analysis also tells us that nativity rates explain very little of the variation in Obama’s performance from state to state. In other words, a state with a low percentage of native-born residents was not clearly more likely to support the president’s reelection bid. Nonetheless, on a case-by-case basis, the nativity rate can tip us off to important changes within a state. While it doesn’t tell us much about Nevada, for example — which has always been a state with a high number of residents born elsewhere — it can reveal something about states where there have been significant decreases in nativity over time. Appropriately for our purposes, the Crystal Ball’s home state of Virginia exemplifies how nativity can matter as a part of the demographics discussion. Chart 3 details the nativity percentage in each state over the last century (from 1910 to 2010) based on U.S. Census data. Many states have had relatively stable nativity rates: for instance, perennially competitive Ohio and Pennsylvania have consistently had populations where roughly three of every four residents were native-born over the past 100 years. However, relatively sharp drops in nativity explain a lot in a few states, including Virginia, which has gone from having one of the nation’s highest nativity rates in the 1910 census to having one of the lowest in the 2010 census. Source: Decennial census data, 1910-2010. Click here to download data. Note: While Arizona and New Mexico did not become states until 1912, the Census did have nativity data from 1910 available for them. In fact, over the last century, Virginia saw the largest decrease in the percentage of people living in the state that were born there (as well as the sharpest downward slope). For the first time in the modern era, the 2010 Census recorded that a slight majority of Virginia residents were born outside the state. That should not come as a surprise: People from across the country and around the world have been moving to the D.C. suburbs to work in government, government relations and corporate jobs in or near the nation’s political center for decades, while others have taken positions in the service industries that have boomed while the region has grown. Consequently, the economic engine of Northern Virginia has altered the political culture of the state. As a Public Policy Polling survey showed in August 2012, those who had lived in the state 30 years or fewer favored Obama (particularly the 10 years or fewer group), while those who had lived in the state longer than 30 years favored Mitt Romney. Although PPP’s poll found equal support for Obama among native and non-native Virginians, the “length of stay” factor in Virginia shows how younger native Virginians — a more diverse group — were more inclined to support Obama. The poll also showed that the Virginia electorate was half native, half non-native, matching the general population as reported by the Census figures. However, Virginia’s nativity rate had already shrunk significantly before the state went Democratic in 2008, the first time it had done so since 1964. An additional factor within the falling nativity rate is the increasing diversity and background of people moving to the state. The foreign-born percentage of the state’s population grew from 5.0% in 1990 to 8.1% in 2000 to 11.4% in 2010. As of 2011, 47% of those who were foreign born in Virginia had become naturalized citizens. And this doesn’t account for any American-born children they or non-citizens have had in the last two decades who have reached voting age. Nationally, the groups most likely to move are minorities, and while this was true previously, the sheer numbers have increased, particularly among Asian and Latino groups. As of 2011, the top three countries of birth for foreign-born Virginians were El Salvador, India and South Korea. In 2000, about 8% of the state’s population was neither solely white or black; in 2010, that figure stood at 12%. (Although the Census Bureau has not previously included Hispanic as a racial category, about 47% of Virginia Latinos counted themselves as something other than white or black in the 2010 Census.) Connecting the dots, simply look at the 2012 exit poll in Virginia: roughly two-thirds of Asian-Americans and Hispanics voted for Obama. While black voters obviously played a key role in Obama’s success in the Old Dominion (20% of the state’s electorate), voters who did not consider themselves white or black were 10% of the state’s turnout in 2012. The Virginia example shows how an increasingly diverse population (whose most varied members are the most likely to move around) can impact an electorate and potentially alter a state’s political culture. It’s also important to consider how nativity rates could signal changes in other states. Returning to Chart 1, the fact that a number of Midwestern Obama states (plus Pennsylvania) have high nativity rates could add to our previous discussion of how the very white Midwest may be key to future presidential successes for the GOP. Conversely, some Southern states, notably North Carolina and Georgia, exhibit similar nativity patterns to Virginia. Like Virginia, North Carolina has become more politically competitive in presidential races as population shifts have occurred, with people from all regions moving to the Research Triangle and Charlotte areas. But while Virginia’s 2012 electorate was about 50% native, polling found during 2012 that the Tar Heel State’s electorate was slightly more than 60% native. Georgia, too, could conceivably be headed for a future of greater electoral competitiveness as its population becomes more diverse and less home-grown. Although Daniel Webster’s time saw the rise of Manifest Destiny, the pull of the California Gold Rush and famous treks on the Oregon Trail, Americans are exceedingly more mobile today than they were in the first half of the 19th century. And as Virginia demonstrates, who stays and who goes can have major political consequences.